Each of our clients is unique, with specific needs and advantages. As we work with different companies, we find that we are often able to open avenues to joint ventures, new business contracts, and highly skilled management candidates. We also know people who can provide equipment or contract financing; we have access to resourceful lawyers and accountants that can help with the maintenance of a company. Some clients ask us for connections that will help them go public or gain a cadre of market makers. While these services are rarely our main brief, we are ready to assist our clients in every way we can. Blue Future demonstrated its true colors by agreeing to work with a cutting edge global aquaculture venture. In a tough American market, Blue Future managed to generate serious interest through creative matchmaking. Internationally, they linked us with industry-specific investment groups and businesses. 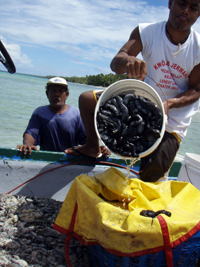 Their view of us is now becoming a tangible reality in the Marshall Islands, Solomon Islands, and Micronesia, with projects started as a direct result of Blue Future's successful business consulting. Thanks Blue Future!